A man who’d watched Schatz work and offered him an opportunity to go from assistant deli manager at Smith’s to being the CEO of a rapidly expanding commercial cleaning operation. It’s been a long and winding road for Rafael Schatz. It wasn’t that long ago that the UNLV grad wanted to be a political campaign manager. But instead he found himself working several part-time jobs to make ends meet. Then a man who’d watched him work and had liked what he’d seen offered him an opportunity to go from assistant deli manager at Smith’s to being the CEO of a rapidly expanding commercial cleaning operation. That man – who wants to remain anonymous – had purchased Clean-Up Time, a porter and maintenance service, last February and had folded it into ServiceMax, a 15-year-old janitorial business. 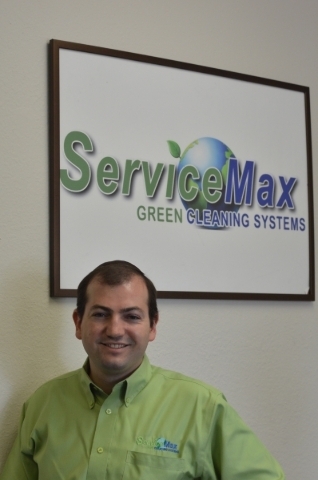 Putting one and one together, ServiceMax gained the ability to handle a business’ entire property, its maintenance, and cleanliness. Today, ServiceMax provides everything from street sweeping to power washing, routine maintenance of buildings to cleaning retail spaces. And the man leading the way is Schatz. Expansion and growth began shortly after the merger. In April, ServiceMax moved up the street to a bigger office with a warehouse nearly twice as large as its previous holdings. While Schatz said the firm does not have a specific goal for market share, he said the focus on green cleaning techniques should provide a strong selling point. Q. Having been raised in Mexico City, when did you come the United States? A. I moved to the East Coast, to Baltimore, when I was 15, on a scholarship. Through my high school, the opportunity came along. A very close friend of mine was working over there (Israel Henry Beren High School). .. He said it would be a great opportunity. I didn’t speak English or anything like that. You’re talking about uprooting everything and moving to another country; no language; no nothing. I was a little nervous at first… By myself, in a dorm, when I was 15… I had to immerse myself in the culture. Had to learn the language quick, because otherwise I was going to fall behind. There were other people also from Latin America and everything else. I did have some help. It was definitely an experience. It was a sink or swim situation. It was very challenging. I had to pull through and I did. I had to immerse myself. I liked it. It was definitely a different experience and I loved every minute of it. Q. How did you end up in Las Vegas? A. My parents moved from Mexico to San Diego and then from San Diego they moved here to Las Vegas, because here it’s a little bit cheaper. My mom got an opportunity to work at the Mexican Consulate and it was a good opportunity. I moved here with my parents and I decided to start school. How were you able to get through school without student loans? My parents, not that they didn’t have any money, they just couldn’t help me with college or anything like that so I had to start working. I got a job at Smiths. I started from the bottom. I had to pay my way through school — working full-time, going to school full-time. I paid my entire college career. Granted I had to live with my parents in order to do that, but I didn’t take any loans. I was at Smiths; I was trying to move up through the ranks. I made assistant manager for the deli department… it’s not what I wanted to do but I was very grateful. Q. What was your major and career goal? A. Political science major. My goal was to make a difference in the political arena. I wanted to make sure that people got opportunity just like I did. I wanted to make sure that people that came to this country. From there, I did some internships and actually volunteered for Congresswoman Shelly Berkley’s campaign at the time. My goal was to become a campaign manager. That was my ultimate goal just things didn’t work out. In the eyes of the law, I was born an American citizen. My birth certificate says Mexico, and culturally and linguistically, there is no question, I was a child of Mexico. During my family’s exploring the possibility of journeying north, my parents discovered they had actually been eligible for American citizenship themselves. It had just been a matter of filling out paperwork–which they eagerly did. Having retroactively became citizens, I then became a child of two American citizens born abroad. It’s a funny story of course, but it leaves the door open for my prospective run at the presidency in 2020! Q. What message can others take away for your story? Sometimes you just don’t get the opportunity, you might have the potential but if you don’t get that opportunity to do it, then you’re not going to be able to succeed. Thank God, I was able to get some opportunities but it was also through a lot of hard work. Nothing came for free. Personally, having emigrated to America and having worked hard to rise to the level of CEO of a company with over 170 employees, it would be irresponsible for me not to appreciate the role of immigrants in our society. ServiceMax welcomes these people with open arms and is proud to employ our next generation of Americans. America is a country of immigrants. We would not be the superpower we are today if it wasn’t for the hope, hard work and perseverance which our relatives had when they came to this country in their pursuit of the American Dream. To that end, we respect those immigrants who are here legally and are willing to work hard and be productive members of our society as part of their pursuit of their own American Dream.